This is the fifteenth post in a series about my possible line of descent from Eleanor of Aquitaine. In the first post, I explained how I discovered the possible line, and how I am going to verify it one generation at a time. In the last post, I proved that my tenth great-grandmother Aleid Laureijs Colen was the daughter of Laureijs Denis Colen and Catharina Jan Adriaens Smolders. The record of the second marriage of mother Catharina. These records will be analyzed for evidence of Laureijs Denis Colen’s parents. The names of the bride and groom in this marriage record closely resemble those of Aleid’s parents. Lijnken is a diminutive of Catharina/Catelijne. As the only Laureijs Denijs Colen and Catharina/Lijnken in the index in this period,2 this has to be her parents’ marriage record. The groom’s patronymic indicates that his father was Denijs Colen. Denis is a common name in Tilburg, which has saint Dionysius as its patron. Denis is the Dutch version of the Latin Dionysius. Colen also is a common name there. 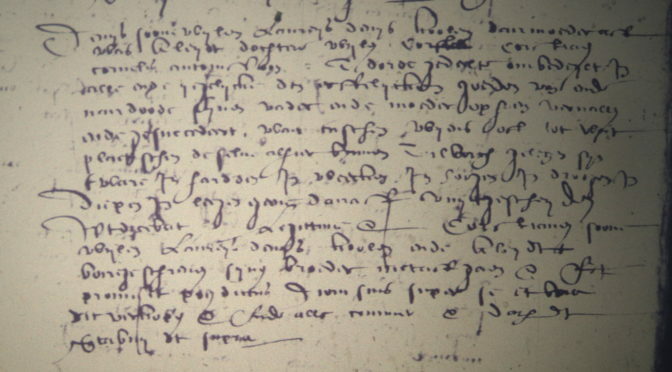 The name of the bride matches that of Laureijs Denis Colen’s wife in the 1602 marriage record. 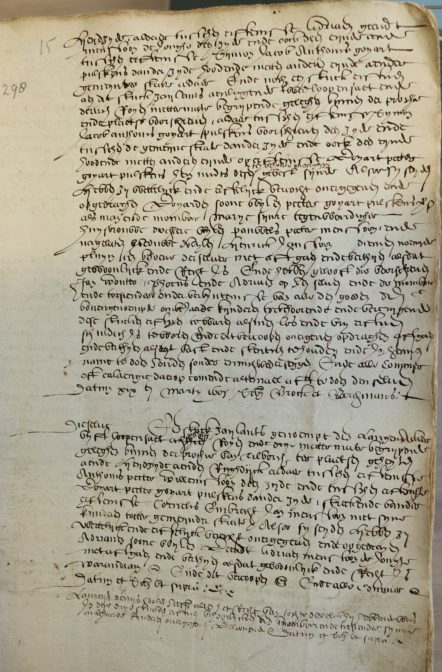 According to the burial record created by the church, Laureijs Denijs Colen was buried in Tilburg on 4 April 1617.4 The time of his death fits with a second marriage of his widow in 1620. The burial record does not give any names of relatives. Based on his patronymic and last name, guardian Wouter Denis Colen was Laureijs’ brother, a logical choice for that role. The other guardian, Peter Jan Adriaen Smolders, was apparently Catharina’s brother, so both sides were represented, as was common. Another relative mentioned in the record was Jan, the oldest son of Laureijs Denis Colen and Catharina, who signed off on the estate division, implying he was already of age. The approximately 100 pages of the guardianship accounts mention several incomes and expenses. They show that the children received a house next to the shed, without specifying its location more precisely. The income includes payments of rents of farm land, indicating that the family owned more land than they used themselves. Wouter Denis Colen, who purchased a wagon, an iron object, some wooden objects, an iron grid, and tongs. The majority of items were purchased by many different individuals. 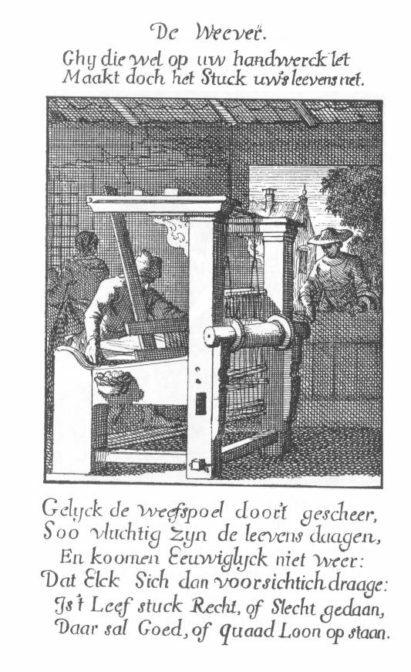 The sold items included several looms and other weaving implements, implying that Laureijs had been a weaver. That is a type of occupation often passed on from father to son. It is possible that one of the man named Denis was his father, although given the different types of property that the accounts indicate, it is likely that Laureijs’ father had already passed away. Jan Denis Colen and Wouter Denis Colen were apparent brothers of Laureijs Denis Colen. The timing of this agreement, during the marriage proclamations of Catharina Jan Adriaens Smolders to Jan Willem Mutsaerts and around the time of the estate settlement of Laureijs Denijs Colen, indicates that this record is about the same Laureijs Denijs Colen. It shows that he had a first wife, Aleijdt, daughter of Corstiaen Cornelis Antonissen, before he married Catharina Jan Adriaen Smolders in 1602. Aleid, the daughter of Laureijs Denijs Colen and Catharina Jan Adriaen Smolders, was probably named after this first wife, as was the tradition. Son Denis might be the Denis Vreijssen [variation of Laureijs] who purchased a kettle from the estate sale in a few weeks later. 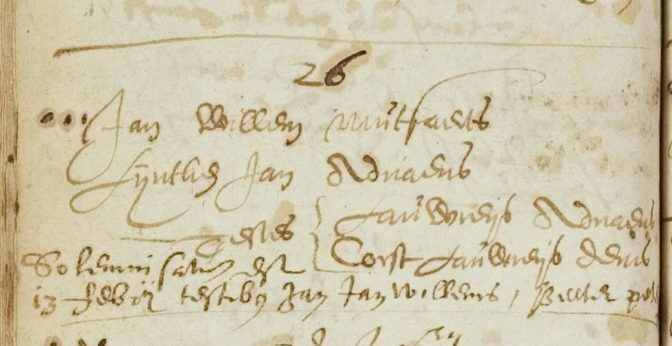 The names of Laureijs, his first wife, and two of the children (Corstiaen and Denijs) match the information from the 1 February 1620 record, proving this is the same family. This record gives Laureijs’ father’s name as Denijs Laureijs Colen, giving us his father’s patronymic. This record identifies Jan, Wouter, Barbara, and Machtelt as the children of Denijs Laureijs Coolen and Barbara, daughter of Peter Goijart Pulskens. The children of the late Laurens Denijs Laureijs Coolen are mentioned as co-sellers, which implies that Laurens was their sibling too. Phocus Jan Gerritsen was one of the purchasers in the 1620 estate sale of Laureijs Denijs Colen and Catharina Jan Adriaen Smulders. His marriage to Barbara, daughter of Denijs Laureijs Colen and Barbara Peter Goijaert Pulskens means he was a brother-in-law of Laureijs. The four pages of heirs in the record are all Pulskens heirs. The inclusion of Laureijs’ children among the Pulskens heirs indicates that Laureijs was the son of Barbara, daughter of Peeter Goijaert Pulskens. Laureijs [deceased], married as his second or later wife to Catharina Jan Adriaen Gerit Smolders, leaving minor children. Wouter Denis Colen appeared as guardian over the minor children of Laureijs Denis Peter Colen and Catharina Jan Adriaen Gerit Smolders in their guardianship accounts. Jan and Wouter Denis Colen and Focus Jan Geritsen were among the purchasers in the 1620 estate sale. The combination of these names shows that this is all the same family. These children are the same as the children of Denijs and Barbara in the 1605 and 1618 records. The presence of these children in the estate division of Barbara’s father shows that they were all her children. If Laureijs had been the son of a different wife of Denijs Laureijs Colen, he would not have been named among the heirs. The entry for Laureijs is written in a different ink and the lack of spacing suggests it was added later. 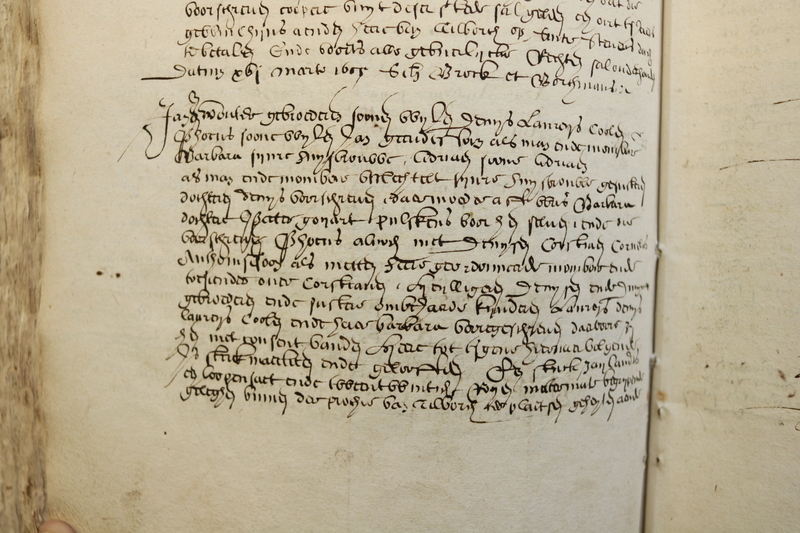 This land is probably the share of the Pulskens estate divided in the 1595 estate division, the same year that this tax book was created. The entry for Denijs Laureijs Colen and Laureijs Denijs is bracketed by those of Sijmon Anthonis Pulskens (seven entries before) and Quirijn Embrecht Pulskens (next entry). These were two other Pulskens heirs that received land from Peter Goijaert Pulskens estate. The timing and neighbors confirm that it is the Pulskens land. Three independently created court records of sales by heirs and estate divisions identified Laureijs Denijs Colen as the son of Denijs Laureijs Colen and Barbara Peter Goijaert Pulskens. This Laureijs’ wife was named as Catharina Jan Adriaen Gerit Smolders in the 1618 record, proving that this is the correct Laureijs Denijs Colen. The siblings identified in these records were frequent associates of the Laureijs Denijs Colen who first married Aleijd Corstiaen Cornelis van Buerden and second Catharina Jan Adriaens Smolders. 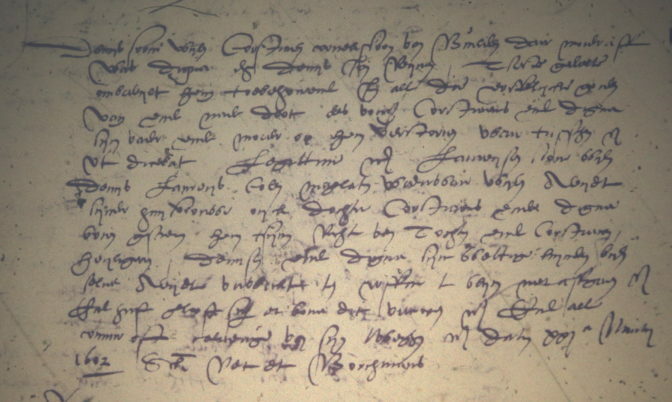 Laureijs Denijs was listed immediately above Denijs Laureijs Colen in the tax record of 1595, suggesting he took over paying the taxes on his father’s land. No evidence was found that identified different parents. Together, this evidence proves that Laureijs Denijs Colen was the son of Denijs Laureijs Colen and Barbara Peter Goijaert Pulskens. That’s fourteen generations down, fourteen to go! The half-way point! Of course, the second half will be more challenging, as records get more scarce. 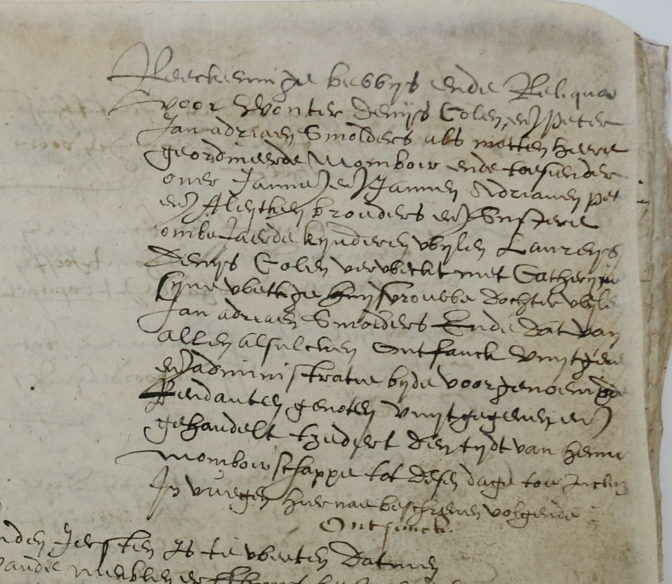 Church records in Tilburg start around 1600, so no church records will be available for earlier generations. 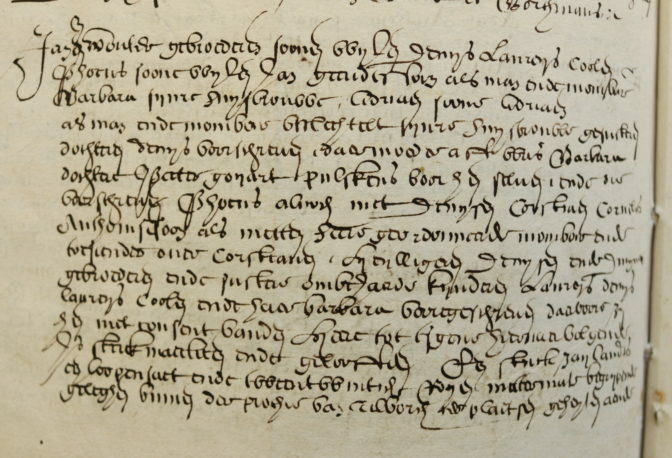 Tilburg court records start in 1495, and will hopefully allow us to trace the line back at least a few more generations. Stay tuned! St. Dionysius Roman Catholic Parish (Tilburg), marriage banns register 1600-1612, p. 202, Colen-Adriaensdr, (14 juli 1602); “Zoek een persoon,” index and images, Regionaal Archief Tilburg (http://www.regionaalarchieftilburg.nl : accessed 8 May 2016). “Zoek een persoon,” index, Regionaal Archief Tilburg (http://www.regionaalarchieftilburg.nl : accessed 18 May 2018). St. Dionysius Roman Catholic Parish (Tilburg), marriage register 1600-1630, p. 153, Mutsaerts-Adriaens (26 January 1620); “Zoek een persoon,” index and images, Regionaal Archief Tilburg(http://www.regionaalarchieftilburg.nl : accessed 8 May 2016). St. Dionysius Roman Catholic Parish (Tilburg), burial register 1617-1630, p. 236, Laureijs Denis Colen (4 April 1617); “Zoek een persoon,” index and images, Regionaal Archief Tilburg(http://www.regionaalarchieftilburg.nl : accessed 8 May 2016). 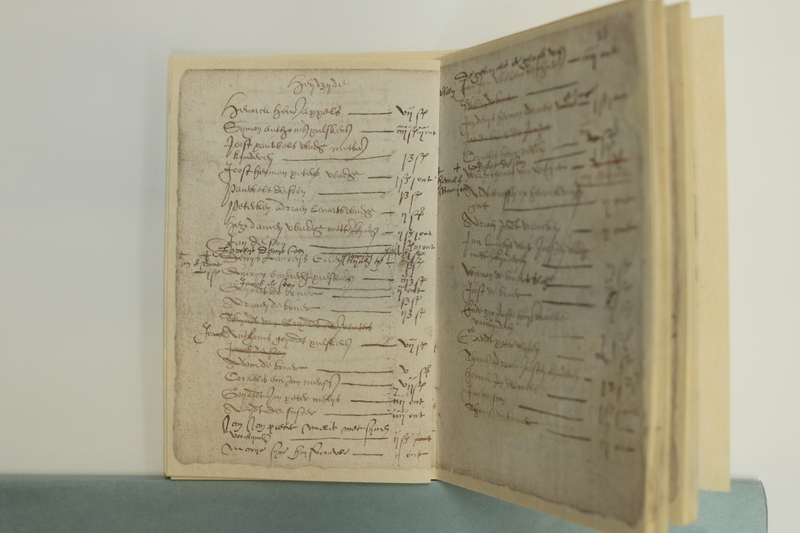 Aldermen’s Court (Tilburg), estate inventory and guardianship accounts of Laureijs Denijs Colen and Catharijne Jan Adriaen Smolders (1620-1628); call no. 8736, Schepenbank van Tilburg en Goirle, Record Group 14; Regionaal Archief Tilburg, Tilburg. St. Dionysius Roman Catholic Parish (Tilburg), marriage register 1621-1633, p. 299, Antheunis-Colen (16 December 1627); “Zoek een persoon,” index and images, Regionaal Archief Tilburg(http://www.regionaalarchieftilburg.nl : accessed 7 May 2016). 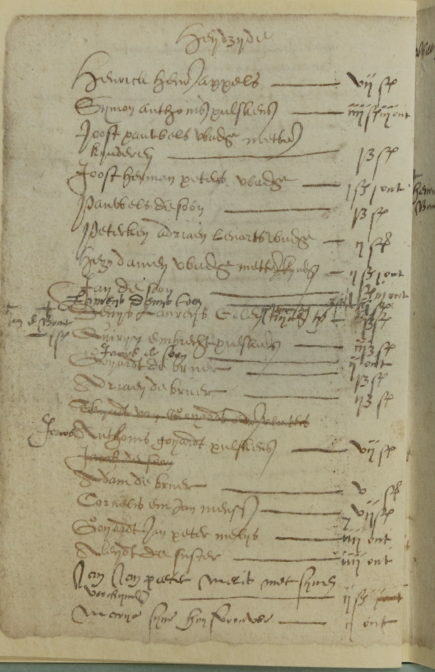 Aldermen’s Court (Tilburg), estate inventory and guardianship accounts of Laureijs Denijs Colen and Catharijne Jan Adriaen Smolders (1620-1628). Aldermen’s Court (Tilburg), general protocol 1617-1620, fol. 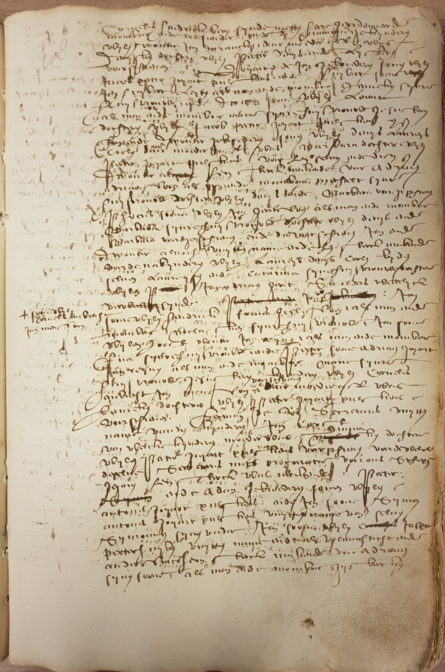 268r, Denijs and Corstiaen Laureijs Denijs Koolen inheritance (1 February 1620); call no. 350, microfiche, Aldermen’s Court of Tilburg and Goirle, Record Group 14; Regionaal Archief Tilburg, Tilburg. Aldermen’s Court (Tilburg), general protocol 1617-1620, fol. 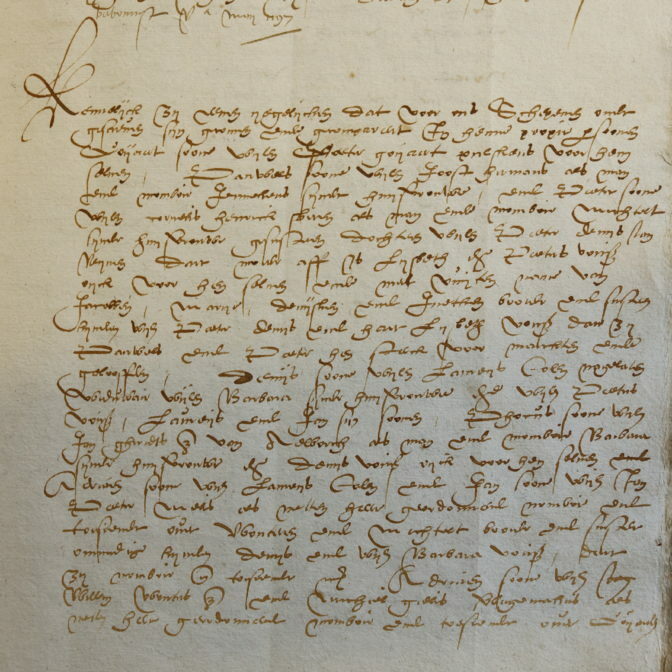 268r, Van Buerden agreement (21 March 1602); call no. 346, microfiche, Aldermen’s Court of Tilburg and Goirle, Record Group 14; Regionaal Archief Tilburg, Tilburg. 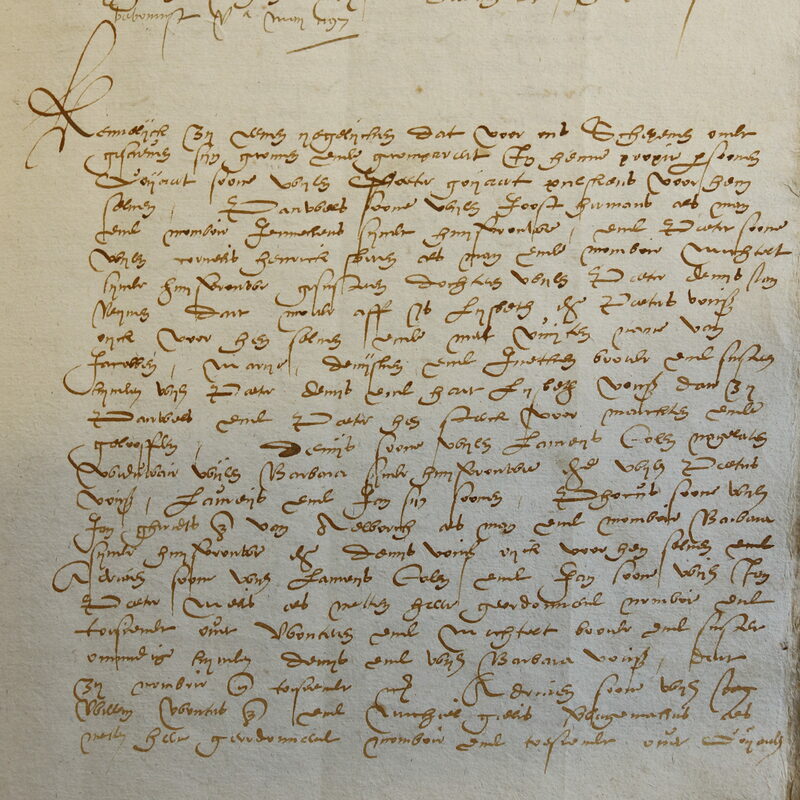 Aldermen’s Court (Tilburg), general protocol 1600-1605, fol. 14v, Colen sale (19 March 1605); call no. 346, microfiche, Aldermen’s Court of Tilburg and Goirle, Record Group 14; Regionaal Archief Tilburg, Tilburg. Aldermen’s Court (Tilburg), general protocol 1617-1620, fol. 107-110, Goijaert Matthijs Wouterssen Denis inheritance (12 February 1618); call no. 7995, Aldermen’s Court of Tilburg and Goirle, Record Group 14; Regionaal Archief Tilburg, Tilburg; scans provided by Regionaal Archief Tilburg. Aldermen’s Court (Tilburg), general protocol 1595, fol. 22r-26r, Peeter Goijaert Pulskens estate division (16 May 1595); call no. 7986, Aldermen’s Court of Tilburg and Goirle, Record Group 14; Regionaal Archief Tilburg, Tilburg. Tilburg, “commerboek” [tax record], 1595, section Heijdzijde; call no. 213, Village Administration of Tilburg, Record Group 3; Regional Archives of Tilburg, Tilburg. I found it interesting that I had just discovered a relative in the south of the Netherlands who also had the name Wouter. I am starting to get into names like yours where the previous generations can almost be predicted through the patronymics… Can you tell me what Wouter is derived from. I have come across one relative who was the Burgemeester van Son who sported that name and none since! Good luck with the second half! Wow, that really is a lot of men named Denis. What treasure – these old records!! Challenging to read, but a ‘cheat sheet’ of writing of the times helps I’m sure. I enjoyed working my way through your findings, documents, and analysis. Hope you find those possible earlier records!